Approximation of Indian villages in the Santa Clarita Valley and vicinity. 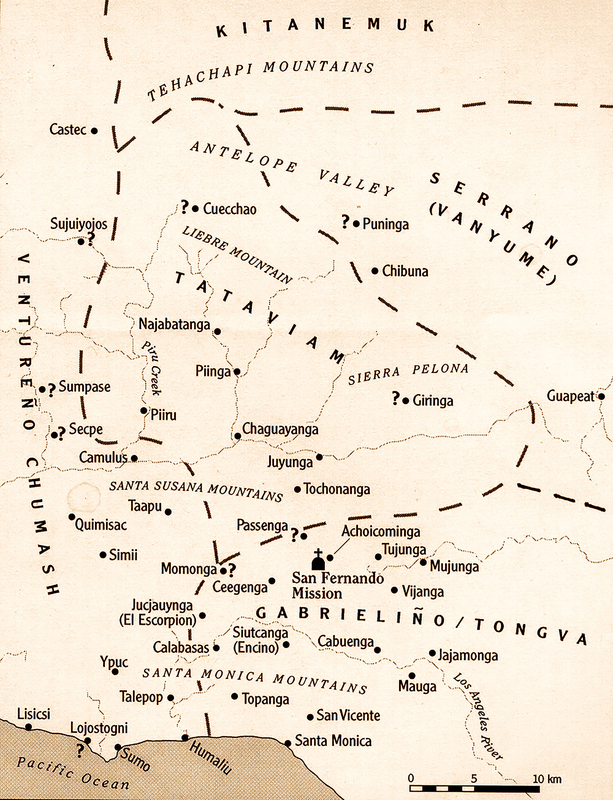 Tataviam villages in the SCV shown here include Tochonanga (in Newhall), Chaguayanga (at Castaic Junction), Piiru (Piru), Camulus (Camulos), Piinga (Elderberry Canyon, under the Castaic Lake Reservoir), and a couple of others whose identity is cloudy. Tataviam Indians, a small group of speakers of a Takik dialect (Uto-Aztecan language family) were present in the Santa Clarita Valley by AD 500, around the time of the introduction of the bow and arrow.